When I prepare my recipes I always calculate the quantities precisely so that I’m not left with unpleasant leftovers. However last week I had to prepare a trifle for 30 people and I exaggerated the doses a bit. I found myself with extra custard and ladyfingers, but without the syrup made out of Alchermes to cover the trifle. I decided to try to mix together the leftover ingredients, bought a box of strawberries, and prepared the sauce. The leftover ingredients with the addition of strawberries created a really nice result, so I created this recipe. Break the ladyfingers into small pieces and pour into the custard. Mix and add a little liqueur to taste. Line a mold with plastic wrap and pour in the mixture while it is still warm. Press down with your hands so that the mixture is well compacted. Cover with another layer of plastic wrap and leave in refrigerator for at least 4 hours. Meanwhile, wash the strawberries leaving some aside a whole, remove the green part, cut in half and season with sugar and vanilla. Allow to marinate until ready to serve dessert. 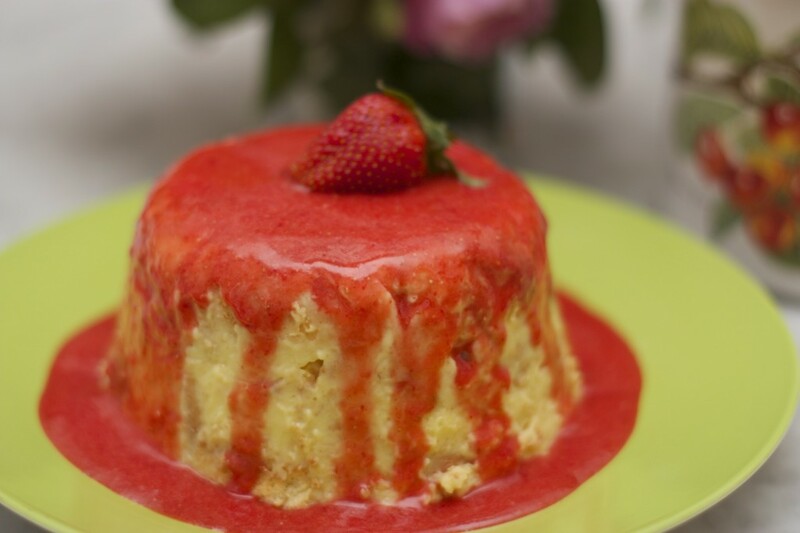 Blend the strawberries and then turn the cake over onto a plate, pour the strawberry sauce over the flan the place a whole strawberry on top.